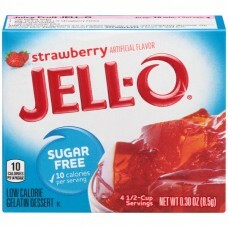 JELL-O® Low Calorie Gelatin Dessert Strawberry. Artificial flavor. Sugar free. 10 Calories per serving. 4 1/2-cup Servings. Net Wt 0.30 oz (8.5 g). Call: 1-800-431-1001. Visit: www.jell-o.com. © Kraft Foods. 1 cup Boiling water. 1 cup Cold water. Add boiling water to gelatin mix; stir 2 min. until completely dissolved. Stir in cold water. Refrigerate 4 hours or until firm. Makes 4 (1/2-cup) servings. Speed-Set Method: Dissolve gelatin mix in 3/4 cup boiling water. Add ice to 1/2 cup cold water to make 1-1/4 cups. Stir into gelatin until slightly thickened. Remove any unmelted ice. Refrigerate 30 to 90 min. or until firm. Special Twist: Prepare gelatin as directed, substituting cold seltzer, club soda, diet carbonated lemon-lime beverage or diet iced tea for the cold water. To add fruit: Refrigerate dissolved gelatin 1-1/2 hours or until thickened. Stir in 3/4 cup to 1-1/2 cups chopped fruit (well drained, if using canned). Refrigerate 4 hours or until firm. Note: Do not use fresh or frozen pineapple, kiwi, ginerroot, papaya, figs or guava. Gelatin will not set.